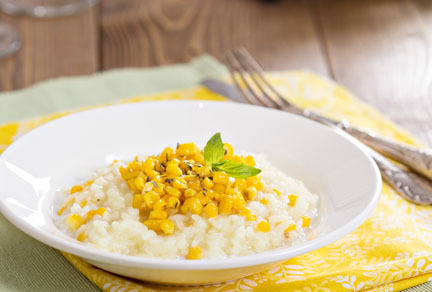 Celebrate Fall with the delicious combination of fresh corn, parmesan cheese and basil. You can substitute frozen corn in this recipe, but fresh corn is worth the extra effort of cutting it off the cob. You will have left over basil oil but it can be used on a salad, roasted vegetables, or drizzled over tomatoes, cheese or pizza. To make the Risotto – in a medium saucepan, bring the chicken stock to a light simmer over moderately heat. Cover and keep warm. In a 12″ sauté pan, melt 2 tablespoons of the butter over medium heat, then add the corn, 1/2 teaspoon of salt, 1/4 teaspoon fresh ground pepper and cook, stirring frequently, until the corn edges turn lightly browned. Remove from the heat and set aside. Cover and keep warm. In a 4 quart sauce pan heat 1 tablespoon of butter with the olive oil over medium heat and then add the shallots and cook over medium heat until softened about 2-3 minutes. Add the rice and stir until the grains are thoroughly coated with fat about 2 minutes. Pour in the wine and continue stirring until the wine has almost evaporated. Add 1 cup of the stock to the rice and cook over medium heat, stirring constantly, until the stock has been absorbed. Continue to add stock, 1 cup at a time, stirring the risotto until the stock is absorbed before adding another cup. When there is 1 cup of stock remaining, check the risotto. If the risotto is finished it should be just tender, give easy to the bite, and the sauce should be creamy. If it is not ready, at this point add the stock 1/2 cup at a time until the risotto is finished. (You may not need all the stock.) The risotto should take 20-24 minutes total. When the risotto is finished stir in the 2/3 of the corn, Parmesan cheese, and the remaining 2 tablespoon of butter. Season to taste with salt and pepper, scoop into serving bowls. Garnish each bowl with some of the remaining corn, a drizzle (1-1/2 teaspoons) of Basil Oil, the basil leaves and serve immediately.